Today modernity and advancement have a totally different face especially when it comes to decorating one’s home. The above picture is a perfect example of modernity as well as advancement. It has an ultra stylish appeal. The walls are grey in color which is out-shined by the glossy floor and closets. The maroon wall in the side is setting in a nice contrast with the rest of the kitchen. The floor and closets are completely black with a glass like finish which is outshining every other color in the kitchen. Equipped with hi-tech kitchen appliances and wares the kitchen is very spacious and contains a little dining area within. The window on the roof is also one of the interesting factors that are making this kitchen attractive. 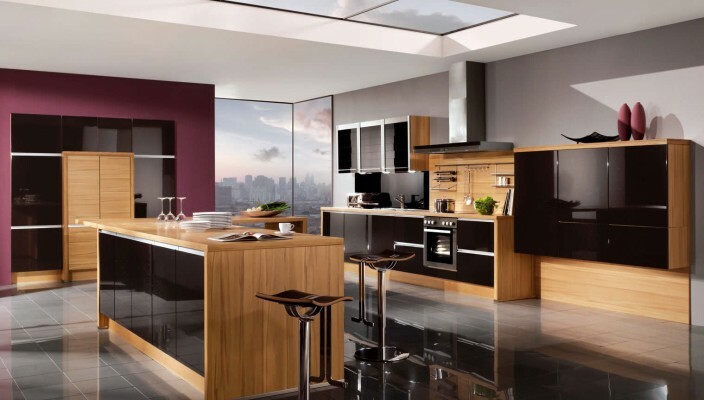 The kitchen seems to be on the top floor of a building which is making it more elegant and stylish because of the view.